Digital camera specialist Basler is starting series production of their latest racer line scan camera models with resolutions of 6k, 8k, and 12k.They are available with either a Gigabit Ethernet or a Camera Link interface, and offer extraordinary line rates of up to 80 kHz. All racer models produce excellent images, and are very attractively priced. Together with the 2k and 4k racer models, Basler’s racer line scan family now covers the whole spectrum of standard line scan cameras. The highly sensitive CMOS technologyof the Basler racer cameras provides for excellent image quality, low noise characteristics, and a quantum efficiency of approx. 60%. With the very low power consumption of the CMOS sensors, and an innovative heat-dissipation concept, Basler racer cameras stay much cooler than comparable line scan cameras, and supplybetter image quality. Basler racercameras are extremely lightweight and have a small footprint for easy integration. With a width of just 56 mm and a height of 62 m, they are an ideal fit for multi-camera systems. Their compact size makes it possible to install several cameras very close to each other, resulting in ahigh spatial resolution of the inspected object in the camera image. 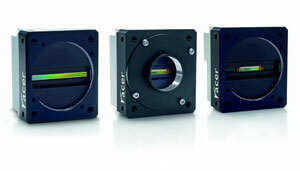 With the new 6k, 8k, and 12k racer models, users from many different markets and applications will easily find a racer camera for their needs.Basler’shigh resolution racer cameras are especially suitable for inspection of continuous materials, such as in web inspection, flat panel display inspection, andsolar inspection. Basler is a leading global manufacturer of digital cameras for industrial and video surveillance applications, medical devices, and traffic systems. Product designs are driven by industry requirements and offer easy integration, compact size, excellent image quality, and a very strong price/performance ratio. Founded in 1988, Basler has 25 years of experience in vision technologies and has designed and manufactured high quality digital cameras for 15 years. The company employs around 300 people at its headquarters in Ahrensburg, Germany, as well as atinternational subsidiaries and offices in the U.S., Singapore, Taiwan, and Korea. For more information, visit www.baslerweb.com.